Describing the "electrical system" on the D.VII is somewhat of a misnomer because of the absence of an alternator. 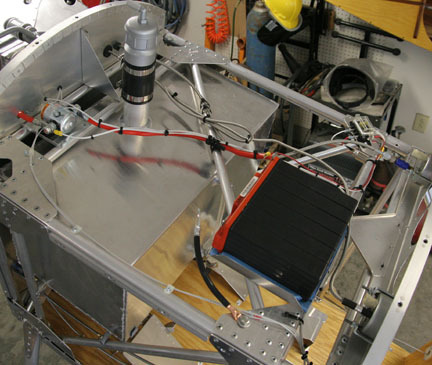 This is a total loss architecture that will require periodic external charging. 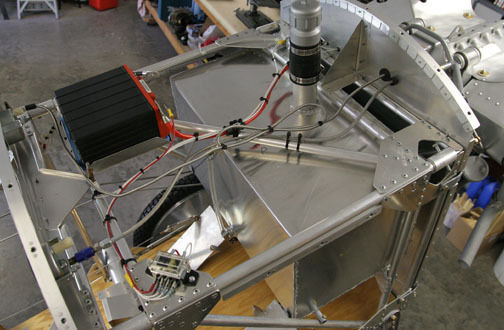 This was adopted in order to limit weight and the mission of the plane is such that electrics are only needed for the starter. The above photo shows most of the components. An AGM battery, in this case an Odyssey PC680, is located near the CG and feeds a master solenoid and small fuseblock. 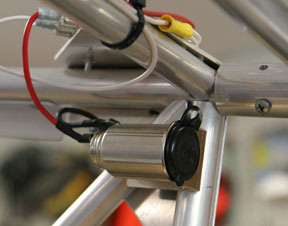 This photo shows the master relay. Everything except the "hot" power outlet is controlled by the solenoid. The battery hold-down straps have not yet been installed. 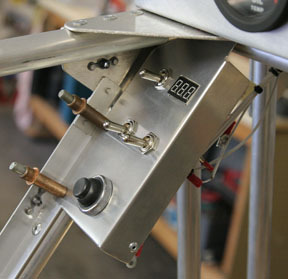 A simple switch panel has the master switch, a digital volt meter, two mag switches and the starter switch. This power outlet is wired hot to the battery via a 10a fuse. It supplies power for small accessories in addition to providing an easy way to charge the battery.